Remind your friends and family of the grand beauty of Adirondack landscapes and wildlife. Each notecard package includes eight cards and envelopes. Adirondack landscape images by photographer Carl Heilman. View more of Carl Heilman II's work at www.carlheilman.com. 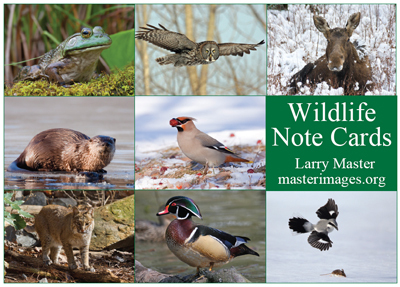 Adirondack wildlife images by Conservation Biologist/Photographer Larry Master. View more of Larry Master's work at www.masterimages.org. Adirondack Landscapes I: Photos include Marcy, Colden and Algonquin from Mount Jo, Winter Morning on the Moose River, Lake George Narrows and Champlain Valley Farmland. 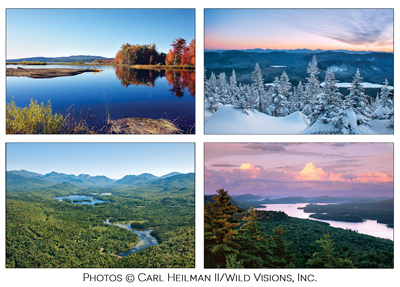 Photos © Carl Heilman II, Wild Visions, Inc.
4 images (2x), 8 note cards and envelopes. Adirondack Landscapes II: Photos include AuSable Marsh, Tirrell Pond and the High Peaks from Blue Mountain, Boreas Ponds and Fourth Lake of the Fulton Chain from Bald Mountain. 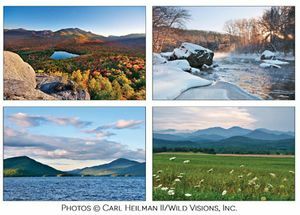 Photos © Carl Heilman II, Wild Visions, Inc.
Adirondack Wildlife: Photos include the American Bullfrog, Great Gray Owl, Moose, North American River Otter, Bohemian Waxwing, Bobcat, Wood Duck and the Northern Shrike. Photos © Larry Master, masterimages.org. 8 note cards and envelopes. 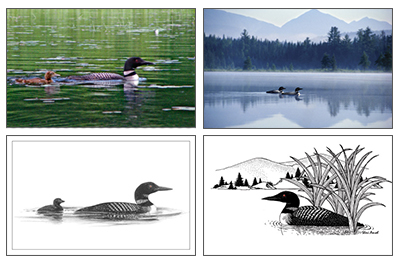 Adirondack Loons: Photos feature the common loon, the symbol of the wilderness. Photographs by Diane Fish (top left) and Carl Heilman (top right) and drawings by Anne E. Lacy (bottom left) and Sheri Amsel (bottom right).